Uuni makes it easy for anyone to enjoy authentic Neopolitan style wood-fired pizza in your outdoor space. The patented Uuni 3 pizza oven reaches temperatures up to 932 degrees Fahrenheit in 10 minutes and can cook a wood-fired pizza in 60 seconds. Uuni can bake pizzas up to 13 inches in size, making it ideal for entertaining with friends or family. Not only for pizza, this oven is great for all kinds of foods from steak to seafood and roasted vegetables. This oven is powered by wood pellets which contain no additives or binders, only real wood. Uuni is made from sturdy brushed stainless steel for long lasting performance. The chimney clips to the oven, allowing you to quickly remove it when you take the Uuni on the go. The Uuni also comes with a cordierite stone baking board, pizza peel, and safety instructions. Just add some pizza dough and your favorite toppings, and you will be enjoying wood-fired pizza in no time! The Uuni pizza oven is warranted against defects in materials and workmanship for a period of one (1) year. When you register your Uuni, the warranty will automatically extend for an additional year. Amazing addition to my outdoor kitchen, best place to buy!!! I have only had this a few days and I have baked pizzas, seared amazing steaks, chicken, rack of lamb, buffalo, Seared Ahi, veggies and I have made a new version of my signature Thrice Baked Potatoes. Today I baked some mini sourdough loaves which I normally do in my solar oven. This oven/cooker is all you would hope for and so much more! 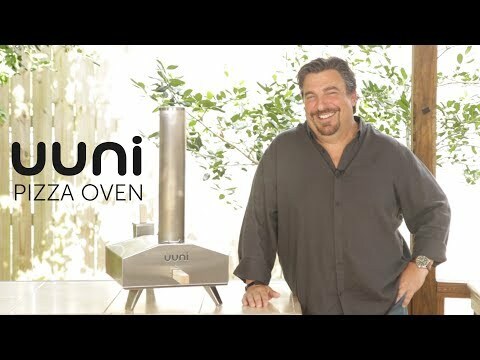 As a retired chef my creativity has just be launched in a whole new direction, I can't wait for the Uuni Pro to arrive, I will be purchasing that one as well!!! What else can I cook in the Uuni beside pizza? (It seems a waste if it can only cook pizzas.) Any recipes or timings? How tall of an item can it cook? I'm thinking 1.5" thick NY Strip steaks, Hamburgers, Hot Dogs, Chicken Wings, Flat Breads, etc. Great question! The Uuni can cook various types of foods including chicken, steak, veggies, hot dogs and much more. The cooking surface is 13 x 13 inches and the opening is 5 inches tall, so it opens the door to lots of options. Is this the most recent version of the Uuni? Hey there! This is the most recent version of the Uuni. Does the unit come with the travel case? Hey, Lance! The travel case isn't included, but we carry it. Here's a link: www.bbqguys.com/uuni/3-pizza-oven-cover-bag Let us know if we can help you with anything else. Hey, Tony! You can make up to a 13 inch pizza with this oven. Most pellets will leave our warehouse within 1-3 business days, but this is dependent on which ones you purchase. We provide ship times for individual items on each item page. Where do I buy the wood pellets for this product? How much do they cost?